Eternal Sunday presents Come To My World, the first single taken from the upcoming Canal Pop album, featuring singer, actress and model Josefina Aufranc. The album will be an homage to the early electro disco music that started with Donna Summer’s “I Feel Love”, produced by Giorgio Moroder in 1977. The single contains the title track and a killer remix by Fr3ak. Both of them are instantly recognizable as Canal Pop songs, respecting the formula of releasing very catchy electropop songs with carefully produced vocal arrangements. 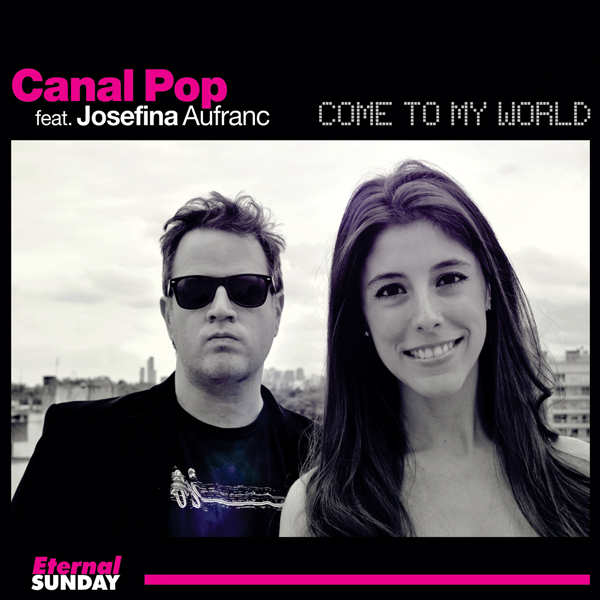 Josefina Aufranc provides crystal- clear powerful vocals. “I want Canal Pop to sound like a mix of Daft Punk and Abba”, said Emiliano Canal, the man behind Canal Pop. “I want a modern sound, but I also love the early electro sound, the old Hi-NRG and Italo disco sound. These were fantastic styles of music, much more original that rock. That’s why we covered ‘I Feel Love’, Giorgio Moroder started a revolution and music was changed forever. But no one took this electronic music seriously when it started”.